Even though a bathroom has limited space, it can still be both functional and attractive. All that is necessary is to consider how to utilise the space available in the best possible manner and the elements you need to accomplish this task. Below, we share some great design ideas that will enhance the appearance and usability of a small bathroom. When you decorate with only neutral shades, you can make a tiny space appear larger. Dark colours tend to close rooms in whereas light ones open the room up to provide the optical illusion of space. Pale pinks, light beige, white, cream, light green and baby blue are just some suggestions for paint colours. Light wood tones opposed to dark ones also are preferable. Think about installing narrow vanities, oblong or rectangular sinks, or even half-sinks that mount to the walls to save precious floor space in your tiny bathroom. You can opt for a shower in place of a tub, as a shower will take less floor space to install in a small bathroom than the amount of open floor area that you will require for a tub. A professional can create all sizes of shower stalls. You will bounce light back into the room more efficiently with a shower enclosure of clear glass than you will with one made of frosted glass. 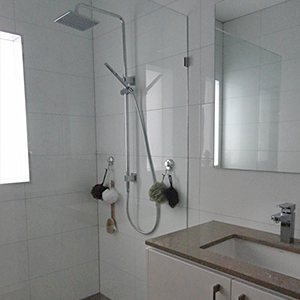 For this reason, shower enclosures of clear glass allow the room to feel light, airy and spacious. Freestanding tubs require less floor space than the drop-in styles need, which makes them a possibility in a small bathroom. Remember, the drop-in style fits into some type of framed enclosure. Various shapes and sizes of freestanding tubs are on the market today. You may think that you need to eliminate large mirrors in a tiny bathroom. No, the opposite is true. Line the wall above the vanity or sink with as large of a mirror as the space will allow for, as this will visually extend the length or width of the room. Tall cabinets in the corner of your tiny bathroom are the perfect storage option. Cabinets such as these require only a minimal amount of floor space while they provide you with sufficient room to store towels and toiletries. Remember, you just need to add the best amenities you can to your tiny bathroom in the least amount of space. The decorations in this room also should not make it look heavy. If you let us, Concept Bathrooms & Construction will show you how your small bathroom can become highly functional and attractive.